1. Combine the lime zest, chillies, garlic, fish sauce and olive oil in a large bowl and whisk to combine. Peel the middle sections of the shells from the prawns, leaving the heads and tails intact, and de-vein. Add the prawns to the marinade and toss to coat. Cover and refrigerate for 30 minutes. 2. Preheat the barbecue or grill to a high heat. 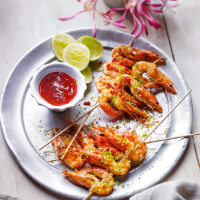 Thread the prawns on to skewers then grill for 3-4 minutes. Turn, brush with the melted butter, and cook for a further 3-4 minutes. Remove from the heat and brush with any remaining butter. Serve with lime wedges.